Home > Hair Loss Basics > What is Hair Loss? Hair loss is defined as the loss of a significant amount of hair at any given point in your life. There are many causes of hair loss, some of which are temporary and some are permanent. Everyone loses some hair each day as the hair follicle prepares for new hair growth. However, excessive hair loss (which can indicate the beginning of a hair loss condition) is defined by notable amounts of hair loss usually discovered on your comb, pillow, or plug hole. Stress – this is a very common cause of temporary hair loss. This type of hair loss is usually seen after a very devastating event, such as divorce or job loss, and will usually resolve itself after the Stress is resolved. Heredity – hereditary loss is passed down through generations. It is typically more prevalent among men, but also occurs in many women as well. Improper diet – not getting enough nutrients in your body, including a variety of vitamins and minerals, as well as water, can often cause significant hair shedding. Medications – there are some medications that can contribute to hair loss, so it is important to always know what the side effects are of any medication you will be taking. Medications such as high blood pressure pills, birth control pills, and chemotherapy are known for causing hair loss. Illnesses – certain illness, such as high fever or thyroid disorders, and scalp conditions, such as psoriasis, are known to cause significant amounts of hair loss. Improper hair care – there are many types of hair products or treatments that can damage hair and the hair follicle. These treatments usually cause temporary hair loss but permanent hair loss can occur if the damage is severe enough. There are two main types of hair loss: permanent and temporary. 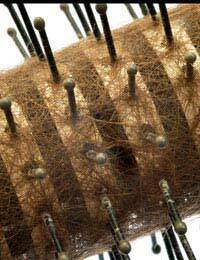 Typically, any type of hair loss that isn’t caused from within the body (genetic) is considered temporary hair loss. If the cause of your hair loss is stress, you can eliminate the stress from your life to achieve healthier hair. If medication or treatment for a medical condition is the cause, the hair will typically grow back once the treatment has stopped. Similarly, you can change your diet or your hair care routine in order to repair damaged hair and prevent future shedding. However, one type of hair loss that is permanent is Alopecia. One subtype of this hair loss condition is known as Male Pattern Baldness. This is the type of balding that is passed down from generation to generation in which the hair follicles on the top and front of the head are no longer able to produce hair. Although this type of hair loss is permanent, there are ways to treat the baldness. Depending on the cause of the hair loss, the treatment will vary. The first step, of course, is to eliminate the cause, if possible. If hair loss is caused by poor diet or hair care techniques, for example, you can simply change your methods. In situations where this isn’t possible, but the hair loss is temporary, you can use hair extensions or Wigs to cover the temporary baldness while you wait for the new healthy hair to grow. If, however, the hair loss is permanent, such as with Alopecia, you can try one of the many treatments available, including medication, hair weaves, or Hair Transplant Surgery. These are all serious treatments and should only be considered under the advice and supervision of a doctor, but they can be a great way to treat baldness and severe hair loss.